Sometimes there’s no way to get through the workday than with your favorite tunes playing in the background. If you’re looking for the best jobsite radio, we’ve done our research to find 10 of the best products around. Jobsite radios have to be tough with high-quality sound and we’re pretty confident our picks are both. Before we get the job site radio reviews, let’s take a look at some of the features you need to keep in mind when shopping. Bluetooth Enabled: Being Bluetooth enabled isn’t necessary and won’t affect the quality of the product. But it’s definitely a nice thing to have, especially if you have an extensive music library on your smartphone. We considered it in our jobsite radio reviews. 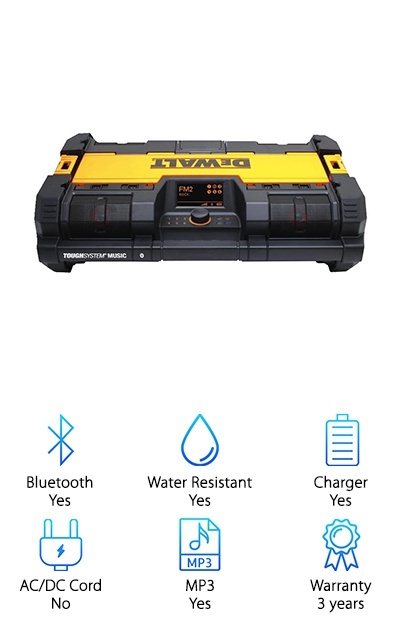 Water Resistant: If you’re going to be working outside in an area that’s prone to inclement weather, having a radio that’s water resistant is a good idea. Plus, you can use it by the pool on your off days. Charger Included: Most of the items in our job site radio review function as chargers themselves so it’s built right in. Keep in mind that in those cases, they do not come with a battery and it must be purchased separately. AC/DC Power Cord: While all of these radios are designed to run off of an AC/DC power adapter, they don’t all come with one. Check to make sure if you have to purchase one separately. MP3 Compatible: Any radio with an AUX cable port is going to be MP3 compatible. As a bonus of sorts, this usually also means that you can easily plug in your smartphone, too, so you can listen to your own music collection. Warranty: Obviously, the longer the warranty, the better. Especially when you’re talking about a piece of equipment that’s going to be exposed to the harsh environment of a worksite. Be sure to find out what is and isn’t covered. Now that you know more about what to look for in the best job site radio, let’s take a closer look at our reviews. Here’s the deal: the top 2 items are our top pick and budget pick. If you’re in a hurry, start here to get some idea of which job site radio is best. Stick around if you can to learn about all of these stellar products. Let’s get right to our best portable radio reviews. 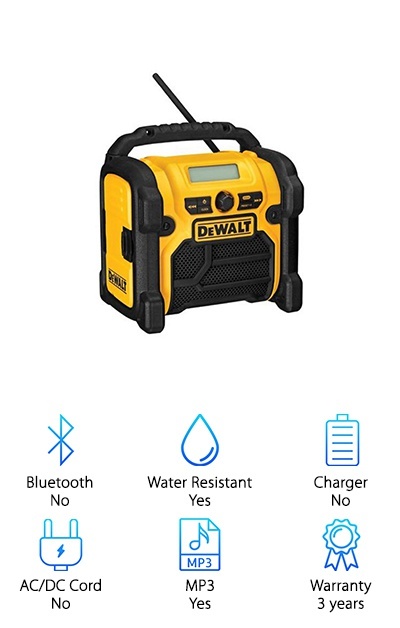 Dewalt is a big name in tools so it’s no surprise that they make an awesome job site radio. One of the best things about this one is that it doubles as a one-hour charger for Dewalt battery packs. In fact, it has a really effective charging system that actually extends the overall life of the battery. Get this: if you don’t have an outlet nearby, the radio is powered by the same battery packs. The controls on this thing are so simple thanks to the user-friendly LED display. You get an AM/FM tuner and can set 15 preset stations. The speakers have dual bass ports so, even though you’re on the job, you’ll still have high-quality sound. 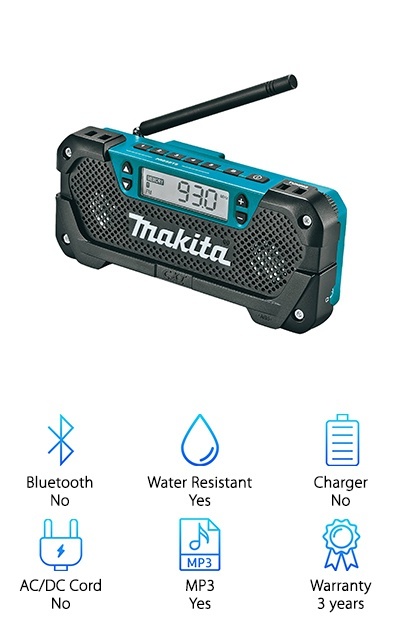 Also, this radio doesn’t come with a battery so make sure you buy that separately. Our budget pick from Sangean is one of the most portable options we found. It’s lightweight with a compact roll-cage design to resist damage from falls or anything it might come into contact with on the job, including water and dust. The build is sturdy and modern - it's a very well-designed product. AM/FM reception is great and you get 12 channel presets. Plus, the digital tuner is backlit so it’s easy to see through the dust that gets kicked up when you’re working. The volume and tuner dials are large and rugged. That’s great because it makes them easy to use, even if you’re wearing work gloves. And don’t worry about volume. 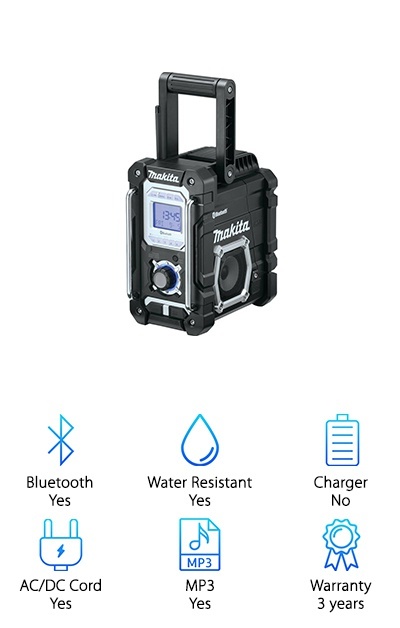 This is one of the loudest jobsite radio gives high-quality sound even in noisy environments. 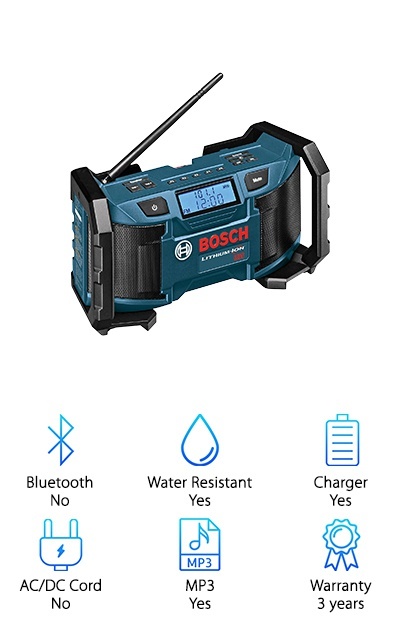 One of the first things you’ll notice about this job site radio from Bosch is that it’s really lightweight. In fact, it only weighs 4.1 lbs! But don’t let that fool you, it still has amazing sound quality. The neodymium speakers project maximum clarity that you can hear over the noise of a busy job site. Something else that’s really great about this radio is the display. It’s backlit and easily visible and it has a power gauge so you can monitor the battery life. The antenna rotates 360 degrees so you’ll always be able to find clear reception for the 10 preset stations. Sometimes a worksite can be pretty hectic and, let’s face it, messy. This radio comes with mounting holes so you can keep it safely out of the way. We chose this Makita as a top jobsite radio for a lot of reasons, one of them being how tech-friendly it is. It’s Bluetooth enabled so you can stream anything from your wireless device to listen to while you work. Of course, if you want to listen to the radio, you can tune into FM stations and have 5 presets. There’s also an auxiliary port for an MP3 player and a USB port if you want to charge your mobile device. The sound on this one is really great, too. The side firing speakers really project the music. As for durability, no need to worry! Protective bumpers help this one take a bit of banging around. It’s also water and dust resistant so you don’t need to worry about exposure on the jobsite. 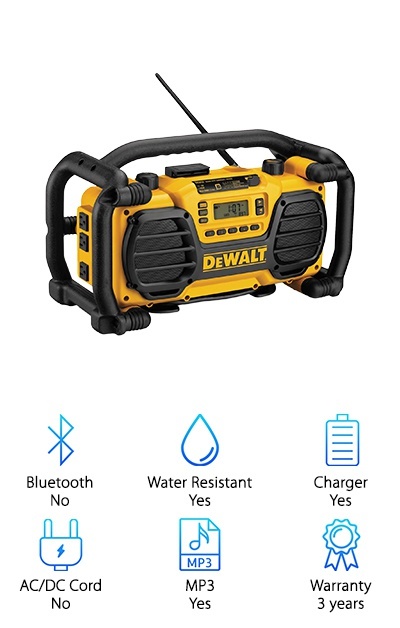 There are a few really cool features that this radio from Dewalt has that are worth checking out, especially if you already use their power tools. For starters, you can run this radio with the same AC/DC power cord that other Dewalt power tools use. Or, charge with the USB port by simply plugging it into an outlet. There are a lot of power options with this one because it’s compatible with Dewalt’s most popular battery systems. That’s not all. The LCD display is backlit and bright and features a clock and 5 preset stations. A protective box covering is built-in to protect it from dust and debris on the worksite. T Plus, there’s a roll cage for extra protection with cut outs so you can hang it on the wall. 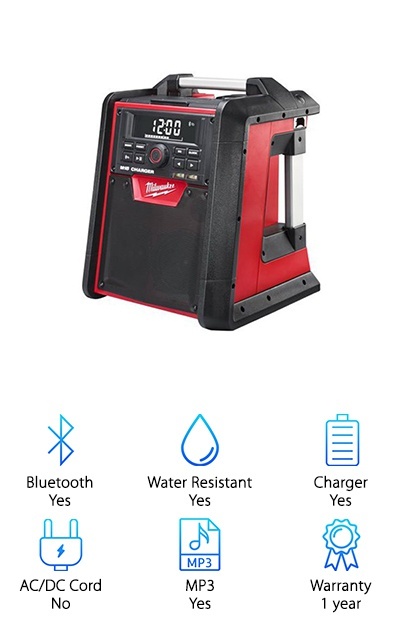 This Milwaukee job radio has a built in charger for all Milwaukee M18 lithium-ion batteries so if you’re into Milwaukee tools, this is the perfect radio for you. You might be asking yourself, what does it sound like? The speakers and 40-watt amp are so great, we were actually impressed. The audio is rich and clear and you’ll be able to hear it over jobsite noise. Here’s something cool: it’s Bluetooth compatible and works from about 100 feet away. You might be wondering, what makes it tough enough for the jobsite? Well, it’s weather-sealed and even has a compartment to protect your small belongings like your cell phone. Plus, it’s also water resistant and has a reinforced roll cage and metal handles for toughness against any harsh conditions. You get a lot of variety with the Ryobi P746. For starters, you can use it with multiple different platforms. Want to plug in your smartphone or MP3 player? You can, just use the USB port to listen to your own music library. Bonus: it also charges your device when you use it this way! Or sync them up through the Bluetooth connection. If you want, you can always take advantage of the AM/FM radio. You get awesome control over the sound, too, thanks to the built-in equalizer. Want to crank up the bass? Well, now you can. You can add extra speakers to this one, too, and immerse the whole jobsite in awesome tunes. One more thing: you can run this one off of a battery or an extension cord. If you’re familiar with the Dewalt ToughSystem, check this one out. If you’re not familiar, here’s a quick run-down: Dewalt makes various modular tool boxes, etc that clip into a trolley for easy transport. 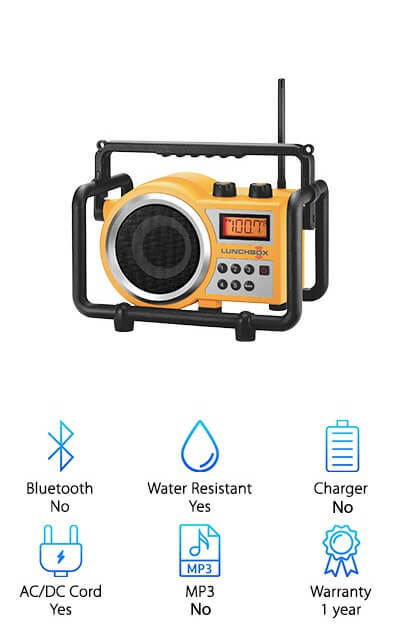 This radio is compatible. What does that mean for you? You can clip it right into the trolley and it becomes a part of your Dewalt system. Even if you don’t have the system, you should look into this one anyway, especially if you’re looking for great sound. Why? It has 4 full range tweeters, a subwoofer, and an assisted bass resonator. This is our pick for best sounding jobsite radio. 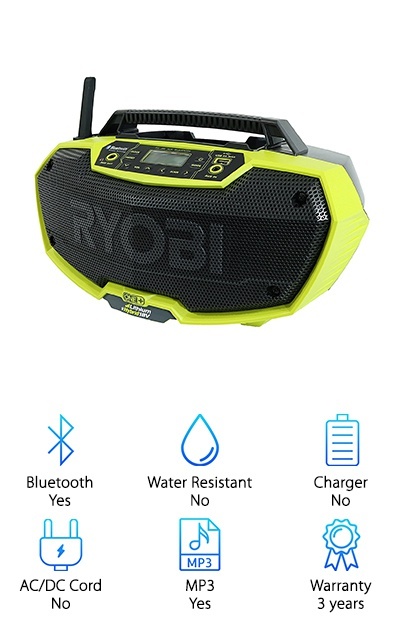 Add to that it’s water and dust resistance, charging capabilities, AUX and USB ports, and Bluetooth abilities and you can see why this radio made our list. This ION Audio Job Rocker is super convenient because it comes with everything you need right out of the box. That’s right. No need to buy a battery or power adapter to use it. It comes with anything. It’s pretty packed with tech, too. 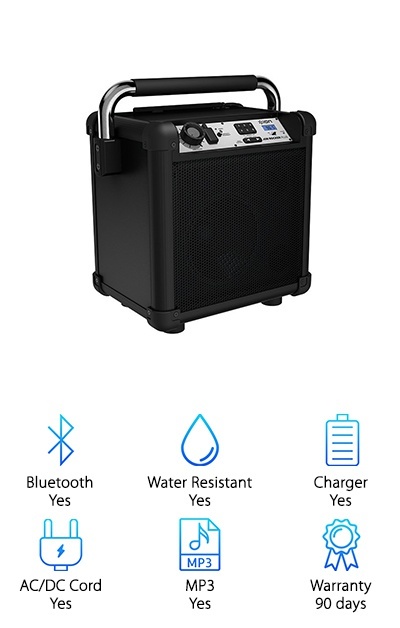 You can use it with your Bluetooth devices to listen to your own music catalog or switch to the AM/FM radio mode to listen to the game, news, or local radio stations. The battery is built-in and it can be charged from a wall outlet or even from your vehicle. So, is it tough? In short, yes. The handles are made of heavy-duty steel while the corners are protected with bumpers. Plus, the controls are large and easy to manipulate even in work gloves. If you’re looking for something pretty company, check out this jobsite radio from Makita. First of all, it only weighs 1.7 pounds. Its narrow design makes it easy to keep it out of the way while you’re working. And get this: it has a rotating hook for easy hanging. That’s not all. You can use the AUX port to plug in your MP3 player or smartphone or tune it into any AM/FM station of your choice. The rubber antenna is short but powerful. Why is that good? You don’t need to worry about worksite activity getting in the way or adjusting a long antenna to keep the music playing. Plus, there are even 10 radio presents and a headphone jack in case you wanted to listen to something privately.